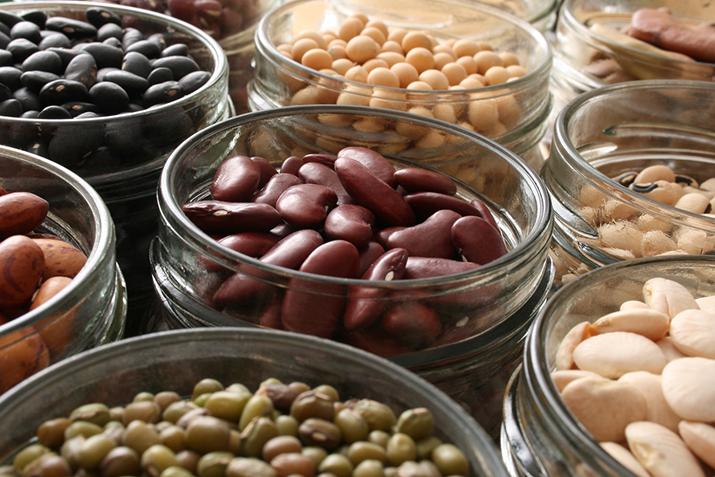 Rinse beans in colander and pick out any stones or shriveled beans that might be mixed in. Soak beans (except adzuki, lentils or split peas) overnight or for eight hours at room temperature. Use six cups of cold water per one pound of beans. Drain soaked beans. Add fresh water (see chart below for quantities) to a large pot and bring beans to a boil. Cover the pot, with the lid tilted slightly so the steam can escape. Gently simmer the beans for the time indicated below. Bring beans and water to a boil, boil for two minutes, cover and remove from heat. Allow to stand one hour, drain water and proceed with cooking instructions. Follow manufacturer’s instructions for your cooker. Do not pressure cook small beans. They clog release valves and quickly overcook. Use two cups water per cup of dried beans. Add a strip of Kombu (sea vegetable) to pot. Discard soak water before cooking. Add Beano® enzyme drops to cooked beans. Add a little vinegar toward the end of cooking. Only salt beans at the end of cooking. Adzuki beans (also called adukis) are native to Asia and are one of the most digestible beans. They taste similar to kidney beans and can be substituted for them in recipes, though they are somewhat sweeter and more flavorful. Try mixing adzuki beans with quinoa, rice or millet, and seasoning them with tamari, ginger or miso. Anasazi beans, originally grown by Native Americans, are red and white speckled beans similar in size to pinto beans. They are excellent in Mexican dishes and have a sweet, full flavor. They are also easier to digest than many other beans. Black beans (also called turtle beans) are especially popular in Mexican, South American and Cuban cuisines. These dark and tasty beans stand up to bold seasonings like chilies and savory herbs. They are a nice change of pace from pinto beans in Southwestern specialties like tostadas and tacos. Black-eyed peas are more closely related to beans than to peas, and like peas, they do not require presoaking. This quick-cooking bean works well added to dishes with strong greens such as spinach, chard or kale. Try them in “Hoppin John,” a traditional recipe from the southern United States, which pairs black-eyed peas with collards, fresh tomatoes and rice. Cannellini beans are large white beans similar in size and flavor to kidney beans. They have a firm texture, mild nutty flavor and are popular in classic Italian dishes like pasta e fagioli and minestrone soup. Fava beans are large brown beans used in Mediterranean cuisine and can be found fresh when in season or dried or canned year-round. Their strong flavor is delicious accompanied by herbed tomato-based sauces. Use fava beans in soups and stews or purée them into a dip or sandwich spread. Fresh fava beans come in pods that need to be removed before eating or cooking. Garbanzo beans, (or chickpeas) are versatile and unique with a mild nutty flavor. The main ingredient in popular Middle Eastern dishes like falafel and hummus, these beans also taste great in salads with fresh herbs and lots of onion and garlic. Great Northern beans (or navy beans) are classic soup beans, white with a mild flavor and creamy texture. They purée nicely and can be used to thicken soups and milk-based chowders, or served on their own as an elegant side dish. Kidney beans and the slightly smaller red beans are some of the most popular in the United States. Kidney beans are often used in chili, soups and marinated bean salads. Firm, flavorful red beans are a key ingredient in Creole classic red beans and rice. Lentils are best known for making hearty soups. There are many types of lentils, but common varieties are small flat red lentils, larger brown lentils, small brown French lentils and smooth green lentils. All lentils are fast cooking and do not require presoaking. Lentils are popular in Indian, Mediterranean and Middle Eastern cuisine. Lima beans (or butter beans) come in large, small and “baby” sizes. Although available dry, this bean is most commonly found canned or frozen. Use lima beans with corn in succotash or cook them with tomatoes and herbs for a simple side dish. Mung beans are very popular in Asian and Indian cuisine. They have a firm, dense texture and their flavor is complemented by curries, chilies and ginger. Mung beans can be substituted for lentils or adzuki beans in many recipes. Precooked mung beans and sprouted mung beans are delicious additions to a vegetable stir-fry. Pinto beans, the traditional bean of the southwest United States and Mexico, are speckled pink and brown when dry, fading to brown when cooked. They have a full-bodied, earthy flavor and are good in casseroles, rolled into a tortilla, or refried. They are served in any number of spicy Southwestern dishes. Soybeans are small round beans native to China, and have the most complete protein of any bean. They are slow to cook but incredibly versatile. Soybeans are often processed and turned into foods such as soymilk, tofu and tempeh. Edamame, the fresh green version of soybean that is served in Japanese restaurants, is sold frozen, either hulled or in the pod. They are a convenient and tasty way to enjoy the benefits of soy. Split peas are small round peas that naturally split in two when dried. They become a soft pulp when cooked and are used primarily for soups and stews. Both yellow and green split peas have an affinity with tomatoes, potatoes and rice. Split peas are delicious in dal, a spicy side dish commonly served in India.